Customers in North America can now pre-order the ASUS Eee Pad Transformer Prime tablet, the first-ever tablet to come loaded with the Nvidia Tegra 3 quad-core processor. In the US, pre-orders are available from Best Buy, B&H, GameStop, and Tiger Direct. For Canadian customers, Future Shop and NCIX are accepting pre-orders. The Transformer Prime tablet ships with Google’s Android 3.2 Honeycomb, but can be upgraded to Android 4.0 Ice Cream Sandwich, making it one of the first tablets to run on the newest version of Android. Hardware features include a 10.1-inch screen (slightly larger than an iPad or iPad 2), with a 1280×800 resolution, which is protected by extra-strong Gorilla Glass. Inside, the Prime packs 1GB of RAM, an 8-megapixel rear camera, and a 1.2-megapixel front-facing camera. The battery has an advertised maximum life of 12 hours. ASUS offers two models, one for $499, which has 32GB of on-board flash storage, or a 64GB model, which costs $599. Users can also boost their on-board storage via the microSD card slot. A mini-HDMI port for connecting to a high-definition TV comes standard, as does Wi-Fi connectability (802.11 b/g/n), though 3G or 4G connections are not supported. 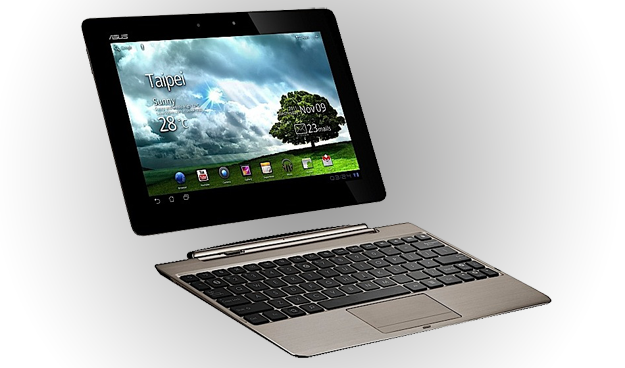 The addition of the Tegra 3 quad-core CPU–which has so far only been available in desktops and some top-shelf laptops–isn’t the only thing that makes the Transformer Prime more robust than most other tablets; ASUS also offers a detachable keyboard ($149), which essentially turns the tablet into an ultrabook.